Fire Safety- It Starts from YOU! How well is your home protected from fire? Is your home safe from fires? Do you know what to do if there is a fire in your home? Do you have smoke detectors? Are they working? When was the last time you replaced the batteries? Understandably, nothing is more important to you than your family’s safety. If you couldn’t answer “yes” to all of these questions, then you need to do something today that will assure you and your family sleep safer tonight. It’s stress free! Even if you answered all the questions correctly, check the information below to make sure you’ve done all you can. Below are “12 simple steps” you can do today that will drastically improve the safety of your home, and assure that your family reacts correctly in the event of a fire. 1 The “Family Escape Plan.” Design a simple escape plan, if possible take to an account two escape routes from every area or room, designate a safe assembly spot outside your home (such as a tree, across the street light pole, or something else) where you family will meet away from home safely after escaping. Take a head count immediately. 2 Exercise fire safety! We all know if we want to be great in something, we have to practice it over an over. Children know that too. Teaching Fire Safety should not be any different. Make time to design and execute your escape plan. Remember: you must make sure there are two exits per every room. Make this exercise several times and repeat it with your children, then encourage them to do it by themselves to make sure that they completely understand what they must do if ever there’s a fire. 3 Keep your household safe! Exercising fire safety should not be an annual routine. It is important that you make it a part of your family’s activities within home. It is as significant as having the understanding what to do encase of a fire incident, I cannot emphasize enough how important it is to take measurements to assure a fire never starts, and if a fire does start, that your family will be alerted as quickly as possible, and not caught off guard. 4 Smoke Detectors! Make sure your smoke detectors work, if you don’t have any, install them today. The National Statistics report that “more than half of all fire deaths occur in homes with no smoke alarms”, in another resent study, close to three quarters of fire deaths occur in homes without alarms or with inoperative smoke alarms. The Massachusetts State Fire Code and the International Fire code require every home and building to have smoke detectors. It is a fact that smoke detectors in readiness increase the chances that all of your family gets out safely by 40-50%! a) Smoke Detectors one in every room! Smoke detectors should be placed throughout your home, and most importantly, in every bedroom up to 3 feet away from the bedroom entry. b) Test them! Make sure they are in good working condition and the batteries are good. You should test them all once a month. c) Not certain? Change them, replace them! If they are old, or if you don’t know if they are in good working condition, don’t hesitate, change them. Upgrading to newer smoke detectors is better protection to you and your family. 6 How often should you change the batteries? Fire departments recommend replacing your smoke detector’s batteries every six months. “Working smoke detectors save lives!” If you can’t remember the last time you changed the batteries, don’t stole, change them immediately! 7 Recognize the sound! Your family members should recognize the sound of your smoke detectors. Have your family with you each time you test your smoke detectors. The faster you recognize that sound, the faster you can respond if ever there’s a fire. 8 Be aware for safety hazards in your home! A damaged electrical cord. Too many devices plugged into one receptacle, old outdated wiring or fuses, a cigarette left burning, furniture too close to a hazard; these are just a few examples of threats within the home. 9 Lack of maintenance can be costly! Many fires have developed from lack of maintenance. Dryer vents that where not cleaned properly or not cleaned at all, chimneys that where not cleaned, boiler systems that where not serviced, old thermostats that where never replaced; they are all fire hazards to your home and shall not be neglected. 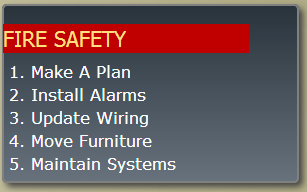 An annual maintenance for all above items shall be in place, and should be a part of your home fire safety plan. 10 Use caution when cooking! Young children should never cook without supervision. Cooking surfaces shall be kept clean to avoid grease fires. A good number of fires start in the kitchen. 11 Are your furniture too close to the fire threat? Keeping your furniture away from areas that can possibly start a fire is important. Don’t keep extension cords hidden under a sofa. Don’t keep furniture too close to a fire place. Keep flammable items safe and away from bookcases. In many instances you can use simple common sense to safe guard your home from fire. 12 Fire extinguisher! Every home or apartment should have a fire extinguisher. Typically the best location is just inside a door or entrance, out of the reach of children. Avoid placing an extinguisher next to fire places or in areas where a fire could develop. Make no mistake, a fire extinguisher does not replace the fire department, but it can certainly stop a small fire from growing. Make sure you know how to use it! It’s too late to learn once a fire has begun.